“One is the loneliest number,” says Three Dog Night, “that you’ll ever do.” Starting over is a hard thing to do, and at the very beginning you have to do it alone. I know all about this, I’ve done it many times. There was a moment in my life in my early thirties when I found I had changed addresses 24 times in 17 years. That is overly peripatetic. While I found a lot of new energy came from changing careers and changing locations, it became clear I needed to settle down a little if I was going to develop some continuity of personality. The tarot card aces are four of those few cards in the tarot that have no people in them, a fairly lonely condition. Here we find on each card an electric glowing hand blazing out from a cloud floating in the dull sky, bringing the exciting new energy of a large emblem of the suit each ace represents, and therefore the element of that suit: Pentacles/Earth/Physical, Cups/Water/Emotional, Swords/Air/Intellectual, Wands/Fire/Spiritual, as always from the mundane to the sublime. The Fool has his journey through the major tarot cards (see the essays on the Long Strange Trips Stages I, II and III,) but he also has his smaller journeys through each of the minor tarot suits. With each new suit he must start solo at the number one, much as he started the majors with number one, the Magician. On the table in front of the Magician we see presented each of the four suit icons, which are later divided up and presented individually in each of the aces to begin the suits. This is the Fool taking up the tools of his trade before embarking on his apprenticeships, where he learns to use these tools as he journeys through the suits. “I was the best flying ace,” says Paul Roland, “that there ever had been.” I myself have been through any number of aces, and put on any number of new suits, had a terrifying number of careers: in graphic arts, social work, probation, law, electronic publishing… more than I can name, one cycle after another. Tarot is one of the few things I have held on to consistently for decades on end. That, my closest friends, a few other characteristics. The first step of each journey is taken alone, new friendships and alliances must be developed, a new identity nurtured. At first the concept belongs only to you, and you must introduce your friends and family to your coming self in a way that allows them to accept the new you. This can be easy or this can be hard, depending on many things. I don’t think people ever had much doubt no matter what I took up that I would somehow conquer it. I would simply announce what my next project would be, people would shake their heads and blink, and then they would know it would be so. My younger sister had a harder time of it, that makes her more of a hero. She went back to school at age 34 and got her Bachelor’s degree, and then at 46 achieved a Master of Science in Psychology. For her this was a tremendous accomplishment, not just finding the new calling and the enduring energy to fulfill it, but the fortitude to persuade people of her new identity. Sometimes I think, as joyful as this time was for her, one was her alone number in that she struggled at first to fly truly solo, and then to get her family, perhaps among others, to recognize her transformation from baby sister to full-fledged professional. “You,” says Bette Midler, “are the wind beneath my wings.” The great spiritual power of the ace may be invisible but it is a very real force which swirls around you and lifts you up with its transformational power. It lifts you, however, in a solo flight as it starts you off on a new journey and on a new path of growth. Perhaps alone is not lonely, but it is a journey you must begin by yourself. A flying ace brings an exciting new energy, the promise of new learning and new skills, representing a challenge for the Fool to become better, the best. At first, the ace brings the dropping away of the supporting characters from previous cycles, but new characters wait for us in tarot cards to come. One may be the loneliest number, but it is also a time to meditate and absorb fresh energy before moving on to meet what new life’s adventures lie before you. It is the most exciting number that you’ll ever do. 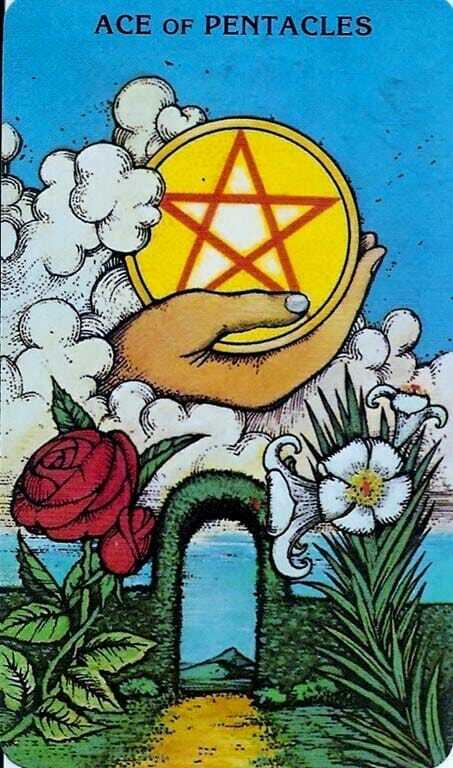 The Ace of Pentacles is from the Morgan Greer deck. The Ace of Cups is from the Tarot Illuminati deck. The Magician is a painting by Christopher Ulrich. The Ace of Swords is from Jala’s Tarot. The photo is of Jule E. Stephens, M.S., M.F.T., my sister. The Ace of Wands is from the Universal Marseilles Tarot deck.